There are various types of honey bees are worth conducting. Among bees of the type of forest bees (Apis dorsata), the local bees (Apis Cerana), and superior bee (Apis mellifera). Superior bee, as the name implies, the most favored market. This type is more productive than the local bees, as well as more benign. Poison sting is very suitable for the treatment of various diseases. Bees are cultivated by most farmers in the world originally came from mainland Europe. Capital required in raising honey bees is the basic knowledge in beekeeping honey, fixed capital investment required in beekeeping activities over a period of harvesting, including the means of production and honey bee colony is ideally a minimum of 40 boxes 100 boxes of honey bee colonies. Take care honey bees at the location provided enough feed. With the availability of adequate feed the queen bee will produce more eggs and the worker bees are also more keen to make a new nest. Prepare candidates for queen honey bees to be placed in the new colonies of honey bees. Separating the honey bee colony that has been solid in the box of the new colony of honey bees and a new queen bee placed candidate or another queen that is so. 4. Bulkhead / separate box with a super bee honey bee queens were in the box below and frames royal jelly honey bee queen candidates placed in the box above. So the queen honey bee can not approach a potential queen honey bees. 5. Let stand for 11 days until the candidate becomes queen bee pupae. 6. After eleven days calin queen bee boxes transferred to the besisi bee colony without the queen. 8. Usually after a week of the queen bee is ready to mate and develop new bee colonies are occupied. Between May and September is the time when beekeper bee honey bee pasture to plantations that provide enough feed honey bees. 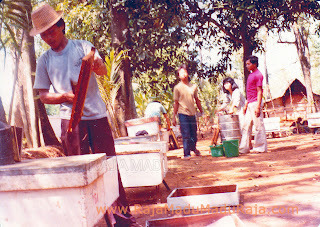 Honey beekeepers on the island of Java generally takr the honeybees into rubber plantations, Kapok, Rambutan, Longan, Mango, Coffee and Duwet. thus generated based on the specifications of flowers honey. Between May hinga September is the time when farmers enjoy the sweetness of the honey bee income from honey bees like honey from a variety of flowers, Bee Pollen and Royal Jelly. After September honey beekeepers experiencing lean times, where the honey season is over. To cover the cost of treatment of the honey bee breeders generally take the bees to farm corn, honey beekeepers here can produce corn Bee Pollen and Royal Jelly. In 2007, many honey beekeepers out of business because erratic weather. Beekeepers as our example calculations prior year longan honey harvest usually around September. Assuming the beekeeper honey bees will mengembalan Ambarawa but due to the erratic weather turns longan trees bloom failed. Breeders who are already bringing bees to the colony where it would be a great loss in addition to the cost of expensive tarnsportasi too many bees are dying of hunger. Indonesian Society things many beekeepers honey crop pests. So most people will repel incoming honey beekeepers to areal plantation. Or if it be allowed as a land lease beekeeping is very expensive. This is very different from the honey beekeepers overseas. precisely beekeepers looking to help pollinate the estate and be rewarded for helping to improve agricultural production. Requirements to be successful in this business enough to gain knowledge and apply knowledge about the life of a bee colony. For example, the ideal temperature is suitable for bee is about 26 degrees C, at this temperature the bees can work normally. Temperatures above 10 degrees C still bees. On the slopes of mountains / highlands normal temperature (25 degrees C). Bees preferred location is the open, away from the crowds and there are many flowers as feed.